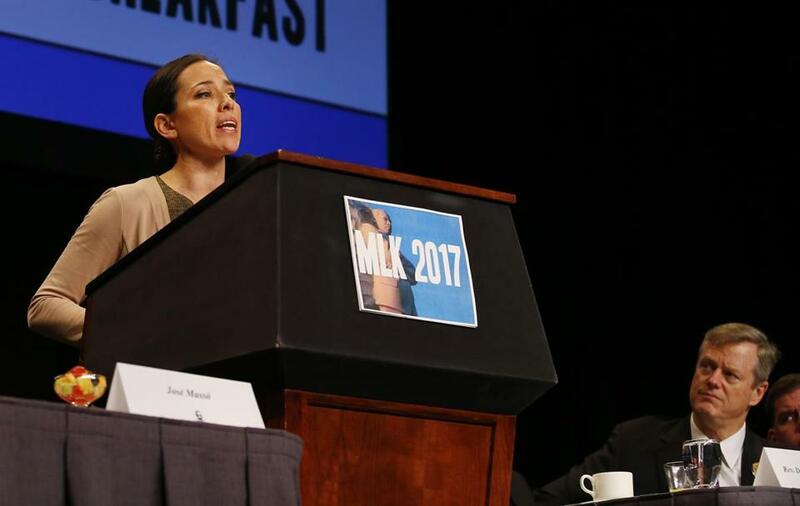 Senator Sonia Chang-Diaz gave an impassioned speech on criminal justice reform last month at the annual Martin Luther King Jr. breakfast in Boston. The lawmakers, speaking to reporters in a gathering convened by Senate President Stanley C. Rosenberg, said they are tired of incremental change and foot-dragging and believe they have enough momentum this year for action. “The criminal justice system, from the front end to the back end . . . is broken, it’s deeply broken,” said Senator Sonia Chang-Diaz, one of about a dozen senators who have filed criminal justice reform bills this session. The senators characterized the reforms as a matter of inequality because people of color and low-income residents are disproportionately incarcerated. It is also a financial imperative, they said, because it is expensive to keep people behind bars. A 2016 report by MassINC, a nonpartisan think tank, found that Roxbury residents are incarcerated at twice the rate of Boston residents as a whole. It also found that more was spent incarcerating residents of the Codman Square neighborhood in Dorchester in 2013 than was spent on grants for gang prevention for the entire state of Massachusetts. However, like many pressing issues that come before lawmakers, criminal justice reform has become mired in politics. The timing of the senators’ press conference was strategic. After years of pushing from advocates, State House leaders in 2015 commissioned a report to analyze the state’s criminal justice system. That report, requested by the governor, Senate president, House speaker, and chief justice of the Supreme Judicial Court, is due out next week. The analysis is being performed by the Council of State Governments, a nonpartisan public policy organization, which has helped 21 other states perform similar work. In the meantime, many criminal justice reform advocates have criticized the scope of the report as too narrow. It is expected to focus primarily on ways to prevent formerly incarcerated people from ending up back behind bars, but advocates say that’s not the biggest problem. The bills the senators discussed Thursday have to do with so-called “front-end” issues like reforming the bail system, raising the age of those who can be prosecuted as juveniles, and preventing youth from becoming involved in crime in the first place. “There’s so much else, a much bigger picture of criminal justice reform,” said Senator William Brownsberger, a Belmont Democrat who cochairs the Judiciary Committee, which focuses on criminal justice matters. Last month, Chang-Diaz gave an impassioned speech at the annual Martin Luther King Jr. breakfast in Boston, calling on her State House colleagues to take bolder, faster action. For more than four years, state leaders have promised to reform mandatory minimum sentences for nonviolent drug offenses but have not delivered on those pledges, Chang-Diaz said at the time. Her district encompasses Jamaica Plain, Roxbury, the South End, Mission Hill, Mattapan, Hyde Park, Roslindale, and Dorchester, areas disproportionately affected by crime. The bills filed are wide-ranging and complex. One aims to decrease the number of people in the criminal justice system by allowing police to issue a citation for certain misdemeanors rather than requiring an arrest. Another bill would limit the use of cash bail and develop a tool to estimate the likelihood that a person will not return to court. Another would create a way to expunge certain juvenile offenses from court records, and another aims to decrease the number of felony convictions by raising the level at which a larceny becomes a felony from $250 to $1,500. Historically, the Senate has been more proactive on criminal justice reforms than the House. Asked about senators’ proposals Thursday afternoon, House Speaker Robert A. DeLeo said he would consider them but is most concerned about preventing recidivism, a key issue the report is expected to tackle. About 35 percent of people released from prison end up back behind bars, according to the 2015 letter state leaders wrote to the Council on State Governments to commission the report. According to that same letter, Massachusetts has experienced an overall decline in correctional population in the past decade and has one of the lowest per capita rates of incarceration in the country. Senators on Thursday said that is true but cited MassINC data that found that the state has also tripled the percentage of the population in prisons and jails since the 1980s. The state’s incarceration rate is also higher than that of many other countries including Spain, China, and Canada, according to MassINC. In Franklin Field, an area of Dorchester, more than one in five male residents age 25 to 29 were incarcerated during the years between 2009 and 2015. If senators want their reform proposals to become law they will also have to curry the favor of Governor Charlie Baker, who has not made criminal justice reform a priority. Senators said they believe that this year there is enough momentum both inside the State House and from groups in the community to pass reforms that go beyond what the report will recommend. The Greater Boston Interfaith Organization has made criminal justice reform its top priority. Last May, the organization held a rally of about 900 people at the Old South Church, where Chief Justice Ralph D. Gants urged the group to lobby hard for criminal justice reforms, specifically mentioning the elimination of mandatory minimum sentences for drug offenders. “I think we may be at that moment where the stars align,” Brownsberger said.